Greece must leave the Eurozone. The only alternative would be to set a lethal precedent of using a public referendum as a strategic negotiation tool. It would blow up the Eurozone as it critically offends Spanish, Italian, German, and Latvian electorates. Leaving the Eurozone would finally put the power with the people, where it belongs, and enable the Greek people to decide what their story for the future will be. The proponents of a big Greek debt haircut have found a new compelling argument: Germany, now the strongest country within the Eurozone, only became the economic powerhouse it is today because more than half of their public debt was written off after World War II. The comparison is false. It was clear to all that the German economy at the time was sound by itself. It was expected that, after an initial write off, it would catch up and become a strong economic motor once again, no less against a gloomy background of a Communism on the rise. How different are things in Greece. The current Greek government rejects the very measures it would need to catch up. So even if they could transform into a country worthy of the Euro, they refuse to do so. Economically, Germany could catch up, Greece won’t. Politicians should not make the fault, again, to say that it will be a one-time deal. Tsipras wanted to strengthen his negotiation hand because he could not deliver the promises he had made. It had nothing to do with honouring the will of the people or furthering the democratic case. If that were his true motive, he would have come down hard on the corruption that has menaced his country for decades, which he hasn’t. Spain and Italy together lent over €60 billion to Greece. These countries had to go through severe and painful austerity policies to deal with their own debt. Now, they should pay for another country that is guilty of deceit and breaking promises, because they don’t want to do it? What do you think they would say? If we allow Greece to use a referendum in such a strategic manner, it will derail future Eurozone policy-making. In addition, it would create an extreme case of moral hazard. You can blow up expenses using borrowed funds, because when it is time to pay the bill, you can just refuse to do so. In addition, it would show that it is alright to fool around with statistics and lie to your creditors. You would reward behaviour that would be considered criminal on an individual level. In any case, it is unfair to Latvia (to name one country) that worked so enormously hard to become a Eurozone country. Economically, having a single currency is acceptable if and only if you accept that money will structurally flow from ‘rich’ to ‘poor’. It happens in all countries, all the time. It happened when Detroit went bankrupt. It happens within the Netherlands (before and after the Euro), within Canada, within Japan, within any country. This is perfectly alright as long as the people accept it. It has become crystal clear that there is not enough social solidarity, or public support or however you name it, in Europe for structural payments to keep up a single currency. Whether you yourself think that Greece should receive structural funds from countries like Germany is irrelevant, the overwhelming majority of the German people think they should not. Following democratic principles it should not and will not happen. More than anything, politics is about hope and future, and about presenting the right narrative. The details need not always be perfect, but citizens need to believe that their country takes care of them; that it is a safe place, where they can raise their children and work towards a bright future. 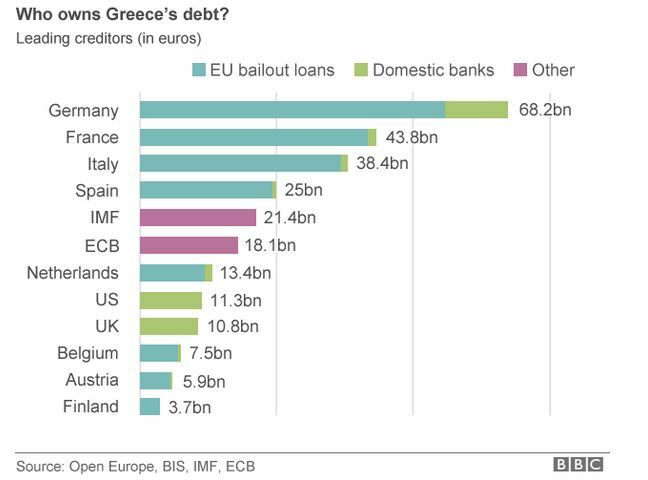 As much as I admire the European Project and its greatest achievement (creating a lasting peace in a historically war-torn Europe), Greece with a Euro simply doesn’t present a story Greek people can believe in. Greece is the birthplace of democracy – how could you force them to accept a program of social policies (austerity policies, no less) drawn up by other countries? You couldn’t. Leaving the Eurozone is unfair in many ways, certainly for the creditor countries. But it does put the power where it should be: with the people. Introducing a new currency will be very hard, much harder than many make it sound. The Greek authorities will have to convince financial markets that their new currency is reliable, a daunting task with a track record of defaults and deceit. Devaluing their currency will not prove to be an easy cure to their economic woes, as it was for Argentina after their default, because besides tourism Greece has no significant exporting sectors. Moreover, they may be forced or tempted to jump into Putin’s arms, which cannot possibly be considered to be any better for the Greek (democratic!) people. But at least they have the freedom to sort out their own mess and decide what their narrative for the future will be. This entry was posted in Economics, Politics and tagged Euro, Europe, Greece, Grexit, monetary policy.